They’re a construction toy but of the soft, squishy kind. They also suction together and come apart with a ‘pop’. They’re flexible and can stick to all kinds of surfaces. They’re certainly not your average building block. They’re Squigz, the hit of this year’s International Toy Fairs and the newest thing in ‘suction construction’. Squigz work by suctioning to each other and to any solid, non-porous surface (walls, windows, the bath, tables and even the ceiling if you want to push the limits). 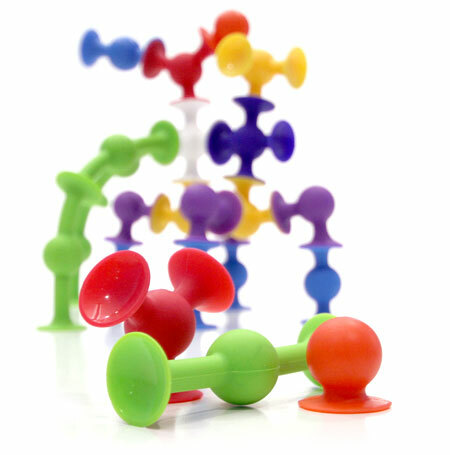 Squeeze the colourful little pieces to create a suction and begin building. Break the suction and the Squigz give a satisfying little pop! Squigz are flexible, defy gravity and can be used for all sorts of creative building. Each set comes with a range of shapes and colours and parents will be pleased to know that Squigz leave no marks or residue – their holding power is all in the suction. The Squigz starter set has twenty-four pieces and the deluxe set, fifty. They are priced at US$24.95 and US$49.95 respectively and are available online from Amazon.